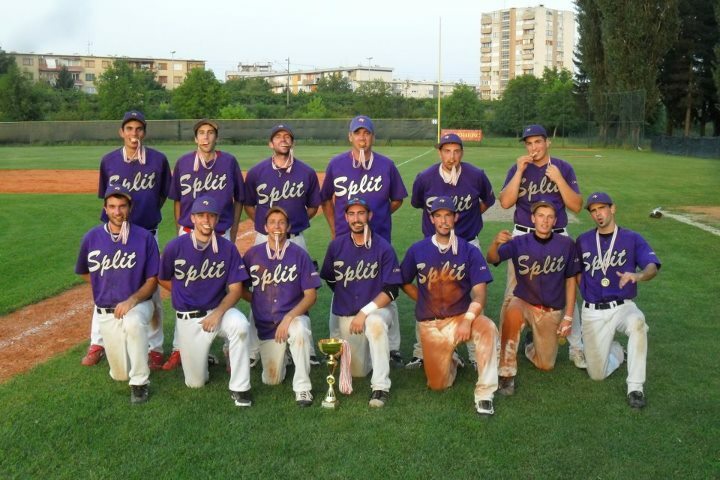 After five games (best of seven series) played in seven days Baseball klub Nada SSM Split won the Croatian championship for the fifth time (1992., 2004., 2005., 2010. ), and seventh time in club history since 1974. Nada SSM Split also won two Yugoslav championships (1980. & 1981.). In this finals Nada SSM Split defeated Olimpija Karlovac (11th time Croatian Champion) 4:1, but it wasn’t an easy walk for Nada SSM Split. In second game Nada SSM Split won 16:7 but Olimpija led the game till the 8th inning with 5:3, when Split offense produced 13 runs with 10 hits in last two inings and ties series to 1:1. Series continued in Split on Tuesday and Wednesday where, in front of domestic audience, Nada SSM Split played two games to remember. In third game starting pitcher for Nada SSM Split was veteran of European baseball, 44 years old Mladen Sasso, who pitched 8 innings and got only one run and 5 hits. On other side Karlovac starter Slobodan Gales got 6 runs and 12 hits in 8th innngs. In fourth game Nada SSM Split had great start and in 3rd inning had the lead of 4:0, but in 5th inning Karlovac produced 4:0 runs and bring game to the beginning. In the next inning Split led off by Ivan Racic with solo homerun which was the start of Split “hurricane” which produced five more runs till the end and took third win in this series with result 10:6. Series returned to Karlovac for fifth game where Nada SSM Split immediately in 1st inning made 5 runs, in 4th it was an unachievable 9:2. Game finished with a lopsided 15:2 for new Croatian champion Nada SSM Split.